We aren't at peak oil at all, just suffering from severe supply management failure. The nature of the oil industry is cyclical and this cycle has been severely exacerbated by price speculation. Hard to say if it's worse than other times, probably not but just seems that way to us now. The market will be undersupplied for a while because everyone stopped drilling when the price tanked. Long lead time projects kept the supply growing for a few years while all the shorter cycle stuff just stopped and now we're going to feel the pinch. If you see oil heading well over 100$ a bbl expect a severe recession to quickly follow. I trust your experience, but it seems like poor business move for the big oil companies. I'm better off making 10% margin from $50/BBL than 5% margin from $100/BBL. I'm no energy expert, but I understand supply chains and distribution. Many of the costs between the natural resource and the consumer are fixed. Others are not. For example, if the tanker trunks themselves have to spend more on fuel to transport gasoline to stations, that's something else cutting in. Add in folks like your self who command a premium wage, and it's difficult to see what the bottom line might be like for the big oil corps. I dont need to travel, or use fossil fuel heat. But, higher oil prices cause everything else to be a bit more expensive. Prices for fuel for cars is already pretty high in my area, I expect it to go over $4/gallon very soon, by summer in this area of CA. Alfalfa has gone up, ostensibly due to higher transport costs, it is up about 25% from last fall. If fossil fuel heat goes too much up in price, then more people go to heating with wood which does effect me, but I live in a forested area, and for short duration issues, I could have a tree a year taken down on my own yard if needed, which would ride out 10years at conservative heating levels. I have done alot to be insulated from economic troubles, but I have been a little complacent lately. If Economic problems get bad, I would expect tht the purchasing power of my fixed income would be reduced, but I would be fine. I have simple needs, if it reduces 20-50% I will ride it out and not starve. If they circumvent the property tax increase limits, I would be screwed, of course, along with many, many others. that is not likely. If economy tanking causes family to lose jobs, I would be affected by having more people in the house, but that would also mean more help in garden, firewood, upkeep, so that would not be a worry. It would also give more limited incomes to pay taxes if they change that. If economic issues increase in the general population, it increases crime, so then I would have to be more vigilant there. Short answer, I am not worried at all. The fluctuating costs come from fluctuating demand for services and such. The problem is that oil companies need to satisfy shareholders and such and acquire more in ground resources to drill, which usually comes from buying out small companies with large offerings of their own stock. Pissed off shareholders means your stock is worth less so its harder to make acquisitions and raise money. High prices mean they make way more money on what they're already producing but if you have high decline rate wells you don't want to bring them on when the price is low and lose out on the potential revenue they could bring. The companies go into a protection mode where they conserve cash they might have otherwise spent on higher risk exploration, which is where their big high dollar finds come from. The industry cost problem is one that is cyclic in nature. Lay off guys when you can't afford to keep them working and they won't be there when you want them back. Huge quick demand for labour quickly exhausts the available labour pool. I would certainly concentrate on getting better mileage. I've since swapped out my Sentra at 30 mpg for a Jetta TDI with 45 mpg, so much easier on the wallet. I'd still have to change up my work day to be 10 hours. If it went high enough, I would even consider getting a cheap hotel for the week and driving home just on weekends. Lots of changes would be required, but we'd get through it. I'm completely I'll prepared in terms of gas mileage. We have two paid off vehicles, both well maintained and comfortable. However they get relatively horrible mileage. SUV gets about 18mpg and my sedan around 22mpg. Is it worth me selling my $6500 car to buy one 2 or 3 times the price to double the mileage? I did some napkin math, and in my area premium 92 octane runs at least $3.50/gal. So my sedan takes $17.5 to go 100 miles. So twice that economy gets me $9 per 100 miles. I drive less than 10,000 miles annully in that car. So let's round up and call that $1000 saved in fuel annually. That's something! But remember my car is paid off, runs great is quiet and powerful, but trade in value is low. For twice the price I could get a late model compact car, but that would take 5 years to break even. Obviously if I doubled my driving habit or fuel prices soared that math shifts quickly. I'm also 6'4" and REALLY appreciate the leg room of full size cars. I doubt we will see many changes based on current prices. 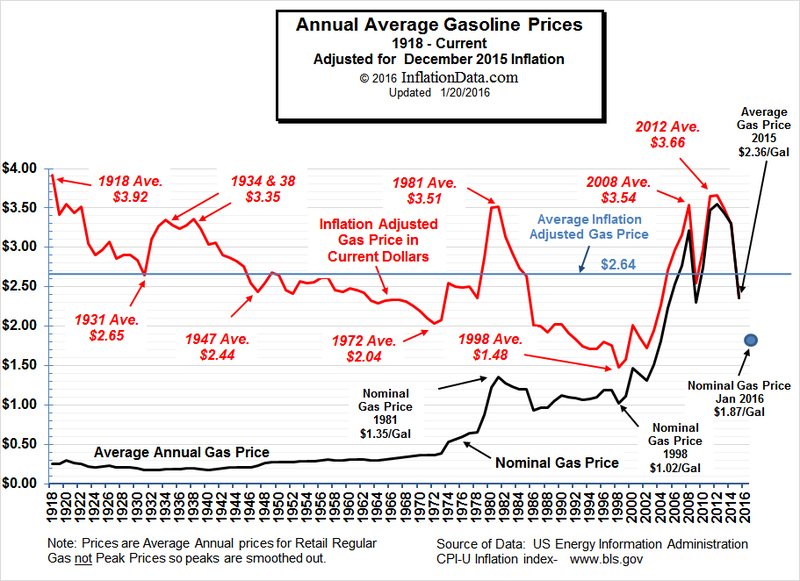 Right now the inflation-adjusted price of gas is right at 100 year historic average. The below chart shows the historic pattern. For comparison, today's nationwide average of $2.82 is equivalent to $2.67 in 2015 terms. Based on past behavior, it would need to get to ~$3.50 before we see significant change in general consumption. The below chart shows the historic pattern. For comparison, today's nationwide average of $2.82 is equivalent to $2.67 in 2015 terms. Based on past behavior, it would need to get to ~$3.50 before we see significant change in general consumption. It really is. What's more, it shows that the real price of gasoline hasn't deviated by more than 50% from its average over the past century. Imagine if the dollar had been that stable! As unstable as the price of gasoline has been, in comparison the dollar looks like a drunken night at the roulette wheel. You have always been able to purchase a gallon with a quarter, so long as that quarter is made of silver. Now that you mention it.... yeah, that's about right! So far we are ok with what the prices are. We are both retired, so don't go very far to get to anywhere other than church. That is about a 20 minute drive. Haven't really seen the price of food going up to much as of yet, but have seen a few increases. If prices of gas go up to high, we have a grocery store we can walk to. Though we don't buy grocery's but once every couple of weeks. As our garden helps a lot on that. I do a lot of canning so that makes a big difference at the check out line. They want to do fracking for oil off the VA coast and N. Carolina coast line. The Naval base is against it as it will badly effect the ships coming in and going out. And they also say fracking will cause earthquakes. This is something that could be really bad if this is true as houses and other buildings are not built to withstand an earthquake. Fracking isn't something that is ever done offshore. Because of offshore drilling costs a formation that would need to be fracked would never be drilled offshore. Fracking does cause earthquakes but they are almost universally the kind that are only felt be instruments in seismic stations. While offshore drilling does pose some risks those two aren't them.